The Energy Department has decided to use a commercial nuclear waste dump while it struggles to reopen its underground storage site after two radiation leaks and a fire since February. 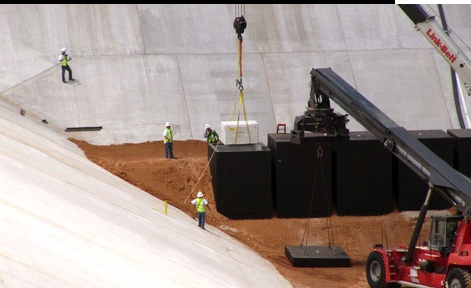 Energy and Nuclear Waste Partners, its contractor for the Waste Isolation Pilot Plant located 26 miles southeast of Carlsbad, N.M., said they plan to ship nuclear waste from Los Alamos National Laboratory to a commercial site in Andrews, Texas, operated by Waste Control Specialists. Andrews is 100 miles east of Carlsbad. WIPP, by law, can only store waste generated by the country’s nuclear weapons programs. Waste Control Specialists stores commercial nuclear waste from nuclear power plants and hospitals. Los Alamos has stored transuranic waste, debris, soil, tools and clothing contaminated primarily with plutonium above ground for years. In 2011, the largest forest fire in the history of New Mexico came within 3.5 miles of this waste, stored in 55 gallon drums and larger containers for machinery. The lab and the state of New Mexico agreed in January 2012 to ship 3,706 cubic meters of above-ground waste from the lab to WIPP by June 30 of this year. WIPP was closed for routine maintenance last month and was supposed to reopen this month to receive waste shipments from Los Alamos. Lab spokesman Matt Nerzig said 80 percent of the 3,706 cubic meters of waste has already been sent to WIPP and the other 20 percent will now be shipped to Waste Control Specialists, starting April 1. Sen. Tom Udall, D-N.M., said in a statement that “Removing waste from the mesa in Los Alamos before fire season is critical to ensure safety in the greater Los Alamos community. The state’s June 2014 deadline was firm and nonnegotiable, as I made clear in repeated conversations with Energy Secretary [Ernest] Moniz since the Feb. 14 accident at WIPP." Udall added, "I’m pleased we have a temporary solution that will ensure there will not be any significant disruption in cleanup efforts" at WIPP. Energy and Nuclear Waste Partners said the waste from Los Alamos sent to Waste Control Specialists will be moved to WIPP for final disposal once that site reopens, but gave no date. Shipments to Waste Control Specialists "are contingent upon the completion of an appropriate National Environmental Policy Act analysis," they said. WIPP stores waste in 16 miles of salt caverns mined 2,150 feet below the surface. Chuck McDonald, a spokesman for Waste Control Specialists, said the Los Alamos waste will be stored above ground at its 1,338-acre facility. Rod Baltzer, president of Waste Control Specialists, emphasized the security of the company’s facilities. “This will allow the Los Alamos National Laboratory to meet its goal of having this material removed by this summer so it can no longer be threatened by wildfires,” he said. “WCS has never had a wildfire because all surrounding areas are covered with asphalt and caliche roadways. In addition, the waste will be in storage facilities that have sprinkler system, and in the event of an emergency, WCS has its own fire truck on site."